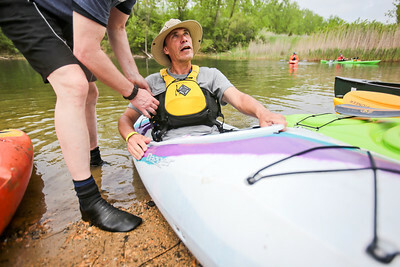 Michelle LaVigne/ For Shaw Media Roger Bennett of Sleepy Hollow tries out a new kyak during the Paddle in the Park event in the Hollows Conversation Area in Cary on Saturday, May 16, 2015. 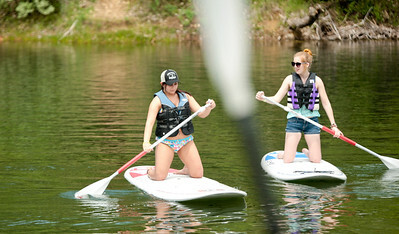 Michelle LaVigne/ For Shaw Media Megan Caroff (left,) and Grace Pifke both of Antioch try out paddle boarding during the Paddle in the Park event in the Hollows Conversation Area in Cary on Saturday, May 16, 2015. 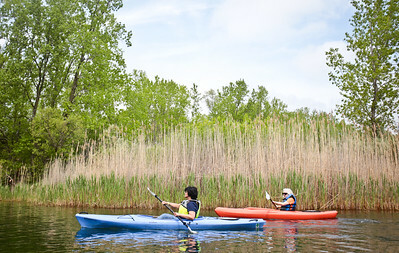 Michelle LaVigne/ For Shaw Media Maria Athas of Cary (left,) and her friend and neighbor JoAnne Knaack paddle their way to shore during the Paddle in the Park event in the Hollows Conversation Area in Cary on Saturday, May 16, 2015. Michelle LaVigne/ For Shaw Media Singer, songwriter and "canoe enthusiast," Jerry Vandiver sings "Any bad day on the water is better than any good day at work," along with fiddling accompaniment by Amberly Rosen of Nashville, Tenn., during the Paddle in the Park event in the Hollows Conversation Area in Cary on Saturday, May 16, 2015. Michelle LaVigne/ For Shaw Media (Left to right starting front,) Penny Hartwell of Cary instructs her five-year-old daughter Samantha Hartwell, while three-year-old Derrin North and his mother Carol of Machesney, Marelene Handschiegel of Hampshire and "Captain" Ron Szeszycki of Wheaton with the Southwest Brigade historical interpreters paddle along in a voyageur canoe during the Paddle in the Park event in the Hollows Conversation Area in Cary on Saturday, May 16, 2015. 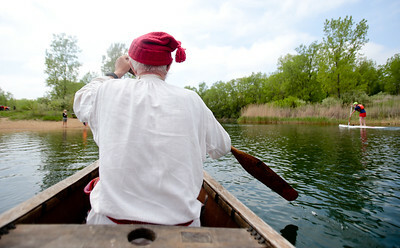 Michelle LaVigne/ For Shaw Media Don Mueggenborg of Lamont and with the wears his toque, a hat popular from the 13th to the 16th century in France, while he paddles on a voyageur canoe during the Paddle in the Park event in the Hollows Conversation Area in Cary on Saturday, May 16, 2015. 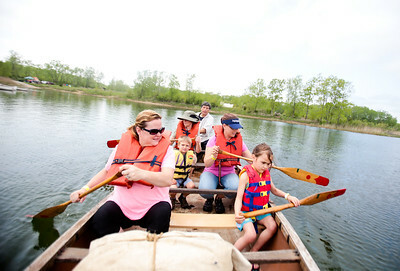 Mueggenborg was a part of the Southwest brigade historical interpreters, who provided trips inside the voyageur to visitors as well as explaining the role of the canoe in early American settlement. 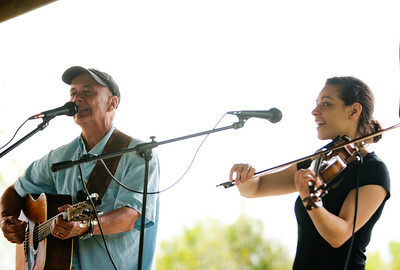 Singer, songwriter and "canoe enthusiast," Jerry Vandiver sings "Any bad day on the water is better than any good day at work," along with fiddling accompaniment by Amberly Rosen of Nashville, Tenn., during the Paddle in the Park event in the Hollows Conversation Area in Cary on Saturday, May 16, 2015.